I was able to attend one of the stops on the Fierce Reads Spring Fling. 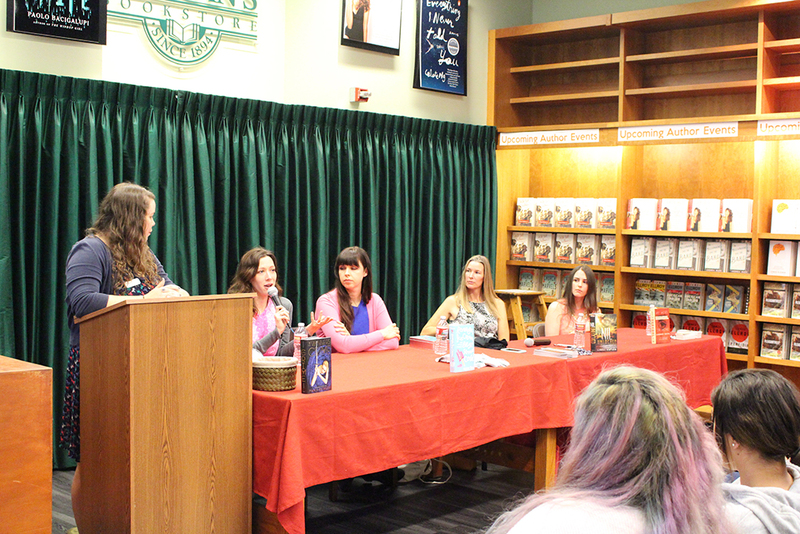 This event was held at Vroman’s Bookstore. This independent bookstore was amazing. If I lived nearby, I would definitely shop there all the time. The day before, I called them to put the books I wanted on hold. I was afraid I was going to be a little late for the event and I didn’t want them to be all gone when I got there. The staff was very helpful and I was able to buy all the books smoothly when I arrived. The Fierce Reads tour was awesome. It started out pretty mellow with the authors posing for photo booth pictures and everyone eating the pizza that was provided. There was also a giveaway to enter and bingo sheets to fill out. Once the discussion started, it was interesting. I haven’t really read any of these authors’ books so I wasn’t too familiar with them, but they were all so nice and the event was pretty great. Katie Finn (Morgan Matson) worked at Vroman’s when she was in college and that inspired her back into the world of YA. Lindsay Smith actually ate reindeer once at a festival in Siberia that was celebrating them. Marie Rutkoski has done some pretty fierce things—like moving to Russia right after college and learning to play the violin two years ago. Lynne Matson described being fierce as an attitude and giving your all for something you want. I was able to move through the signing line pretty quickly. I took pictures with the authors earlier so they just signed my books and a poster for a giveaway. They also gave me extra bookmarks when I mentioned I was having giveaway so be sure to enter, which you can do so here! The event was great. The authors were all so nice and I hope to meet them again the next time they’re around my area. Plus, the bookstore was impressive! I definitely want to attend another event at this store.